This page is used for my customers and bakeries to order large shards to me made buy hand in any color, sizes and clarity. View the photos attached to get an idea of variation. 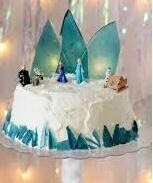 They are used especially on Frozen Theme cakes, Snow white as pieces of broken mirror, etc. Create your own theme. They are sold by the 1/2 pound and each half pound contains approx. 6 large shards (depending on the size you need. A 1 pound order contains at least 12 or more large shards. It you are looking for the smaller bite size shards, use this link to order. They will help your wallet survive the party. 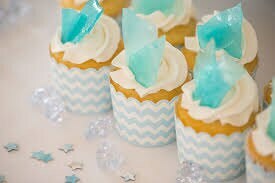 The smaller shards make wonderful tasty favors too. Also 3 ounces for each 3x5 inch favor pouch. 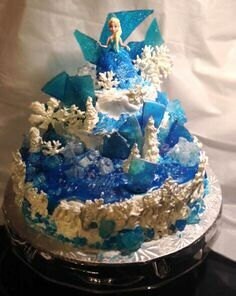 Please send a photo of the cake you are replicating or estimate the heights of the pieces. These are cut by hand and not shattered from a sheet pan so I can come close to the sizes you need. Please give me quantities of the sizes in inches at check out time in the note section. Thank you. Beautiful addition to the cake. Janet was great to work with and helping me customize my order. She even drove in the snow to make sure I got them on time. Great product and service, would happily buy from her again! Thank you! 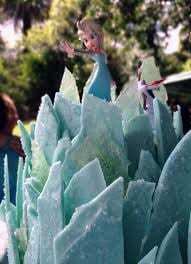 These shards were the perfect addition to my Frozen cake! !